John Flavel (or Flavell) was born in 1628 in Bromsgrove, Worcestershire. He was the son of Richard Flavel, a minister who died of the plague in 1665 while in prison for nonconformity. John Flavel was educated by his father in the ways of religion, then “plied his studies hard” as a commoner at University College, Oxford. In 1650, he was ordained by the presbytery at Salisbury. He settled in Diptford, where he honed his numerous gifts. He married Joan Randall, a godly woman, who died while giving birth to their first child in 1655. The baby died as well. After a year of mourning, Flavel married Elizabeth Stapell and was again blessed with a close, God-fearing marriage, as well as children. In 1656, Flavel accepted a call to be minister in the thriving seaport of Dartmouth. He earned a smaller income there, but his work was more profitable; many were converted. 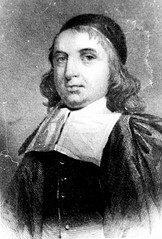 One of his parishioners wrote of Flavel, “I could say much, though not enough of the excellency of his preaching; of his seasonable, suitable, and spiritual matter; of his plain expositions of Scripture; his talking method, his genuine and natural deductions, his convincing arguments, his clear and powerful demonstrations, his heart-searching applications, and his comfortable supports to those that were afflicted in conscience. In short, that person must have a very soft head, or a very hard heart, or both, that could sit under his ministry unaffected” (Erasmus Middleton, Evangelical Biography, 4:50-51). Flavel was ejected from the pulpit in 1662 for nonconformity, but he continued to meet secretly with his parishioners in conventicles. On occasion, he would preach for them in the woods, especially on days of fasting and humiliation. Once he even disguised himself as a woman on horseback in order to reach a secret meeting place where he preached and administered baptism. At another time, when pursued by authorities, he plunged his horse into the sea and managed to escape arrest by swimming through a rocky area to reach Slapton Sands. In 1665, when the Five Mile Act went into effect, Flavel moved to Slapton, which was beyond the five-mile limit of legal disturbance. There he ministered to many people in his congregation. At times, he would preach secretly in the woods to larger numbers of people, sometimes as late as midnight. Once, soldiers rushed in and dispersed the congregation. Several of the fugitives were apprehended and fined, but the remainder brought Flavel to another wooded area where he continued his sermon. In 1672, King Charles II issued the Declaration of Indulgence, giving Nonconformists freedom to worship. Flavel returned to Dartmouth, licensed as a Congregationalist. When the indulgence was canceled the following year, Flavel once more resorted to preaching secretly in private homes, secluded neighborhoods, or remote forests. Flavel’s second wife died during this time and he married Ann Downe, a minister’s daughter. They were happily married for eleven years, and had two sons. In the late 1670s and early 1680s, Flavel carried on his ministry mainly by writing. He published at least nine books in this period. In the summer of 1682, he was forced to seek safety in London, where he joined the congregation of his friend, William Jenkyn, known today for his commentary on Jude. In 1684, soldiers interrupted a prayer service Flavel was conducting with Jenkyn. Flavel narrowly escaped arrest. 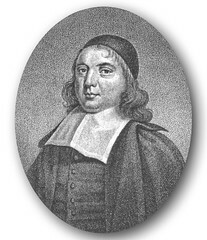 During his stay in London, Flavel’s third wife died. He married Dorothy, a widowed daughter of George Jefferies, minister of Kingsbridge; she survived him. In 1685, Flavel returned to Dartmouth, where his ministry was confined to his home. He preached every Sunday and on many weekday evenings to people who crowded into his home. That same year he was burned in effigy by a mob, but he pressed on, praying for his beloved Dartmouth, “O that there were not a prayerless family in this town!” In 1687, King James II issued another indulgence for Nonconformists that allowed Flavel to preach publicly once again. This freedom was later augmented with the coming of William of Orange and the Glorious Revolution in 1688. Flavel was humble, godly, and learned. He spent much time in study and prayer. One of his children wrote, “He was always full and copious in prayer, seemed constantly to exceed himself, and rarely made use twice of the same expressions.” He was well versed in church discipline, infant baptism, and a number of Oriental languages. Flavel’s preaching was blessed by the Spirit. Robert Murray M‘Cheyne tells about an American immigrant, Luke Short, who remembered listening to Flavel preach in England when he was fifteen years old. The text was, “If any man love not the Lord Jesus Christ, let him be anathema maranatha.” Eighty-five years after hearing Flavel preach on the horror of dying under God’s curse, the Spirit of God effectually converted him at the age of one hundred as he meditated on that sermon! Flavel’s power as a preacher came out of his depth of spiritual experience. He spent many hours in meditation and self-examination. As Middleton writes, “He [Flavel] attained to a well-grounded assurance, the ravishing comforts of which were many times shed abroad in his soul; this made him a powerful and successful preacher, as one who spoke from his own heart to those of others. He preached what he felt, and what he had handled, what he had seen and tasted of the word of life and they felt it also” (ibid., p. 58). While meditating on heaven on one occasion, Flavel was so overcome with heavenly joy that he lost sight of this world. Stopping his horse by a spring, he viewed death as the most amiable face he had ever seen, except that of Christ’s, who made it so. When he finally arrived at an inn, the innkeeper said to him, “Sir, what is the matter with you? You look like a dead man.” “Friend,” Flavel replied, “I was never better in my life.” Years later, Flavel said that he understood more of heaven from that experience than from all the books he had ever read and all the sermons he had ever heard on the subject. The Works of John Flavel (BTT; 6 vols., 3,600 pages; 1968). Flavel’s complete works were printed five times in the eighteenth century, three times in the nineteenth century, and several times in the twentieth century. Repeated printings of his writings (also in individual paperback editions) testify to their sound doctrinal instruction and spiritual application. They have been used by the Spirit to influence many people, including notable divines such as Jonathan Edwards and George Whitefield, and Scottish evangelical leaders such as Robert Murray M‘Cheyne and Andrew Bonar. Archibald Alexander, the first professor at Princeton Seminary, read Flavel when he was a teenager. He later wrote, “To John Flavel I certainly owe more than to any uninspired author.” Edward Bickersteth wrote, “There are few writers of a more experimental, affectionate, practical, popular, and edifying character than Flavel” (cf. Iain Murray, “John Flavel,” Banner of Truth, no. 60 [September 1968]: 3-5). 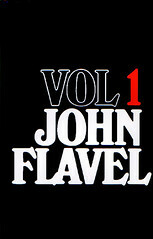 The first volume of Flavel’s Works describes the life of John Flavel and includes “The Fountain of Life.” Volume 2 contains “The Method of Grace” and “Pneumatologia: A Treatise of the Soul of Man.” Flavel deals with the origin, nature, and capacities of the soul and its union with the body. He proves the immortality of the soul and shows how it loves and “inclines” to the body. Volume 3 contains the remaining part of “Pneumatologia,” in which Flavel stresses that we ought to think often of death, particularly our own, before it comes. As believers, we should strive to begin to be what we expect to be, realizing there is nothing between us and those who have died but a breath and moment of time. Thoughts of hell can also benefit us by making us more aware of the horrifying end of sinners. These thoughts can also make us more conscious of the purpose of our existence. More than a hundred pages describe the souls of believers in the intermediate state, and twenty pages deal with souls of unbelievers in the intermediate state. Flavel concludes by stressing the value of our souls and our need to redeem time. “A Practical Treatise on Fear,” based on Isaiah 8:12-14, focuses on fear and how one’s own fears are the cruelest tormentors. “Some fear more than they ought, and some before they ought, and others when they ought not at all,” Flavel writes. “The Righteous Man’s Refuge,” based on Isaiah 26:20, stresses how God’s people rest in God and how His attributes of wisdom, faithfulness, unchangeableness, and love are revealed when He pours out His wrath upon a nation. “The Causes and Remedies of Mental Errors” stresses the differences between matters of faith and human opinion. Flavel exposes the dangers of errors that creep into the church. This volume concludes with “Gospel Unity,” a sermon based on 1 Corinthians 1:10, which promotes unity in the church of Christ. In addition to “England’s Duty Under the Present Gospel Liberty ” and “The Mystery of Providence,” volume 4 includes “Mount Pisgah,” a thanksgiving sermon based on Deuteronomy 3:24-25; “A Narrative of Some Late and Wonderful Sea Deliverances”; “Antipharmacum Saluberrimum” [“A Most Wholesome Antidote to Poison”], a short treatise providing eight ways that believers should respond to temptation and trial, particularly the special pressures of the moment exerted by Roman Catholicism; and “Tidings from Rome, or England’s Alarm,” which stresses the need to oppose the papacy and prepare for a time when Roman Catholicism might prevail in England. Volume 6 contains an excellent question-and-answer exposition on the Westminster Assembly’s Shorter Catechism, as well as twelve helpful meditations to prepare believers for the Lord’s Supper, followed by a dialogue between a minister and a doubting Christian on attending the Lord’s Supper. The volume also includes several additional sermons and three minor treatises on preparing for suffering, defending infant baptism, and the need for personal reformation and conversion. Flavel’s work includes catchy titles, striking sayings, apt quotations, and simple illustrations. We know a pastor who has profited greatly from reading a sermon or chapter of Flavel every morning for decades. When he finishes volume 6, the pastor begins over again with volume 1. If you can afford only a few sets of Puritan works, Flavel’s should be included. Christ Knocking at the Door of the Heart (GM; 400 pages; 1978). Originally titled England’s Duty Under the Present Gospel Liberty (1689), this book contains eleven sermons on Revelation 3:20. It explains God’s offer of Christ to sinners, the natural heart that resists that offer, and Christ’s patience in persisting with the offer. Flavel suggests that every conviction of conscience is Christ’s knocking for entrance into the soul. Christ is an “earnest suitor for union and communion with the souls of sinners,” Flavel says. Christ will not refuse the vilest sinner who is willing to open to Him; rather, His own quickening voice enables the sinner to receive Christ by faith and to commune with Him. That is the great goal of the gospel. The last sermon on the “mutual, sweet, and intimate communion between Christ and believers in this world” is worthy of repeated reading. This book is particularly helpful for convicted sinners who are struggling to find liberty in Christ. 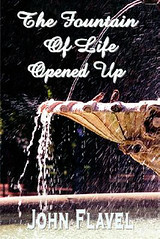 The Fountain of Life (GM; 556 pages; 1977). This book, subtitled A Display of Christ in His Essential and Mediatorial Glory, contains forty-two sermons on the riches of Christ’s offices and states. The book offers a comprehensive Christology with a devotional accent. Chapter 3 alone, on the covenant between the Father and the Son, is worth the price of the book. The book also contains fifteen sermons on Christ’s sufferings, from the Garden of Gethsemane until His burial. It rivals Friedrich W. Krummacher’s Suffering Savior for experiential warmth and depth. Flavel says this book was written “in a time of great distractions [persecutions].” No doubt his faith was greatly strengthened by his reflections on the great sufferings of his glorious Savior. Keeping the Heart (SDG; 170 pages; 1998). In this work, originally titled A Saint Indeed, Flavel examines how to keep the heart and why this is the great calling of every believer. He suggests six ways to keep the heart before God: (1) converse with your heart, (2) let the evils of your heart humble you, (3) pray for grace, (4) resolve to walk more carefully with God, (5) be jealous for holiness and afraid of sin, and (6) be aware of God’s omniscience. Flavel provides powerful motives for keeping our hearts. He says that will help us understand “the deep mysteries of religion” and preserve us from dangerous errors. It will prove our faith as real and sincere. It will maintain joy through the means of grace, such as praying, worshiping, and listening to sermons. It will furnish grist for prayer and make us strive more for revival. It will help keep us from falling into sin, promote better fellowship among believers, and enable us to preserve our impressions of spiritual truth. God has used this book to convert many. For example, a gentleman from London tried to purchase some plays at a bookshop. 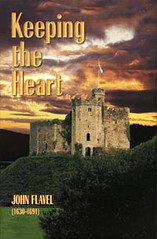 The owner had none in stock, but recommended Flavel’s Keeping the Heart. The man from London swore and threatened to burn the book. Still, he bought it. He returned a month later, saying that God had used it to save his soul. “Can I purchase one hundred copies?” he asked. Included in the SDG edition are a helpful introduction, outline, and study guide written by Maureen Bradley, making this an excellent book for adult study groups. The Method of Grace (GM; 560 pages; 1977). In five sections, this book describes the work of the Spirit in applying Christ’s redemption to sinners. It consoles the weak believer and exposes the dangers of false comfort. In the first section, beginning with union with Christ ( John 17:23), Flavel shows how the Holy Spirit applies Christ to the soul ( John 6:44) so that faith can receive and fellowship with Him ( John 1:12; Ps. 14:7). In the second section, Flavel invites sinners to come to Christ by means of His titles and benefits. Those titles include Physician, Mercy, Altogether Lovely, Desire of All Nations, Lord of Glory, and Consolation of Israel. The benefits include forgiveness of sin, acceptance with God, Christian liberty, reconciliation, and glorification. Flavel shows in the third section how coming to Christ implies true conviction of sin, “being slain by the law” (Rom. 7:9), and being “taught of God” (John 6:45). Section four describes evidences of union with Christ, including the indwelling of the Spirit (1 John 3:24), becoming a new creature (2 Cor. 5:17), mortifying sin (Gal. 5:24), and imitating Christ (1 John 2:6). The last section shows “the lamentable state of unbelievers” in their spiritual death and misery (Eph. 5:14), their condemnation ( John 3:18), and their unbelief (2 Cor. 4:3-4). This book searches the believer’s heart, challenges faith, and enriches love. 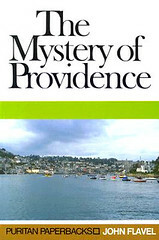 The Mystery of Providence (BTT; 221 pages; 1963). First published in 1678 as Divine Conduct or the Mystery of Providence Opened, this frequently reprinted book is based on Psalm 57:2, “I will cry unto God most high; unto God that performeth all things for me.” It explains the following doctrine: “It is the duty of the saints, especially in times of straits, to reflect upon the performances of Providence for them in all the states and through all the stages of their lives” (p. 20). Flavel’s book is rich with illustrations. For example, when dealing with the difference between what Flavel calls “our time” and “God’s time,” Flavel concludes that our time is not the proper season for us to receive our mercies, since God’s delay “is nothing else but the time of His preparation of mercies for you, and your heart for mercy, so that you may have it with the greatest advantage of comfort. The foolish child would pluck the apple while it is green; but when it is ripe it drops of its own accord and is more pleasant and wholesome” (p. 139). This excellent book on providence opens avenues of spiritual knowledge and experience that few believers have probed. It is invaluable for understanding God’s purposes for our lives. Flavel teaches us how to find delight in discerning how God works all things in the world for His glory and our good. True Professors and Mourners: Two Works by John Flavel (Rhwym; 176 pages; 1996). This small book contains two works: The Touchstone of Sincerity and A Token for Mourners. The first book, based on Revelation 3:17-18, probes the sincerity of one’s Christianity and ruthlessly exposes hypocrisy. The second, based on Luke 7:13, discusses Christ’s advice to the widow of Nain who is mourning the death of her only son. Flavel warns against immoderate sorrow and presents ways of curing that problem. The language of this book has been updated for modern readers, but the binding and formatting quality are seriously deficient.